Successfully Added Mini DV Camera - World's Smallest Hi-Res Camcorder (18 FPS) to your Shopping Cart. World's smallest high-resolution mini DV camera with a great frame rate capture of 18 FPS and a bonus 2GB micro SD card included free! This digital camcorder in an ultra-compact form factor provides great portability and carrying convenience since it is small enough to fit on your keychain or lanyard. Easy to use with a powerful feature set, this video recorder offers crisp and vibrant image clarity on both the video recording and still image capturing. The high resolution (18 frames per second) mini DV recorder uses a standard 2GB Micro SD card (included) for fast and convenient transfer of digital files and is even capable of using a micro SD card of up to 8 GB's for hours of high FPS video recording. With its unique clip and bracket feature, the DV camera can be securely attached to backpacks, hats, pockets, collar and other suitable locations for optimum filming. This flexible design provides support for wide angle shooting and 360 degree panning while you are out and about on a day of adventure. With its well built all metal casing it can take a fair amount of abuse and while continuing to record your days adventures or misadventures ;-). The possibilities are practically endless with this superb DV recorder. It makes a great gift for your favorite sports enthusiast or an even better gift for yourself! This unit is in stock now and available for single sample orders or bulk wholesale quantities. 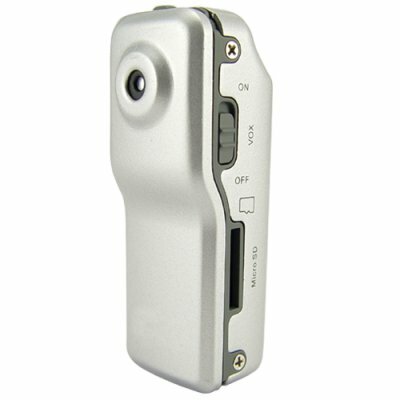 The J07 Mini DV Camera can be attached by clip or lanyard to your clothes, backpack, bag, etc. I received this in 10days in Virginia, I was surprised by how small it is. I use it in my car for accident protection hopefully to record the other guys bad driving. I put in a 8GB card and can record for about 4hrs, audio sounds very good also. Very Fast Delivery 3-4 days to UK from China. Will definitely be buying again!